I went down to my dad’s for ten days to look after the place while he went and got some sun in Mexico. It was a pretty good time. Jim came down and we walked on the winter beach. My sister and boyfriend came down and we all had a big dinner with Jim’s son Milo. I got a PS2 and played some video games on my own system for the first time since I had an Atari 2600. I read the page proofs of my book and managed some tech-support-ish issues with the damned thing. If all goes well it will be sent to the printer in the next week or two. I wrote a long article about the process that will be published on Monday. I’ll be sure to toss up a link to it. I also visited a bunch of libraries including the Westport Public Library and the New Bedford Public Library (a new favorite of mine) but neither of those were what I was going to mention. This week a photo of mine, a picture of the Somesville Library in Maine, got published, in print in AAA’s Northern New England Magazine. Someone had found the photo on Flickr, and dropped me a note offering me some money if I’d let them print it. I said sure. I’m surprised how many people have mentioned to me that they’ve seen it. The other library is the nascent Digital Public Library of America, a new project from the Berkman Center and some other folks. I was invited to a big all-day meeting yesterday down at Harvard to talk about what this project might look like. It was an impressive group, I met a lot of wonderful people and made a few pitches for people to pay attention to usability and scalability but mostly listened. I talked about the digital divide over mealtimes. David Weinberger was there too and he wrote down some of his thoughts. I’m still a little out of it after nine hours of meetings and three hours of driving and eleven hours of sleeping all on the tail end of a long away-from-home-ness. The meeting took place with Chatham House Rules so that people could speak freely, so I had a hard time figuring out what was okay to say and not say. I took a lot of notes, both written and typed and hope to sum things up here or at librarian.net in the next few days. It’s a fascinating time to be a librarian. Sounds like a busy few days. 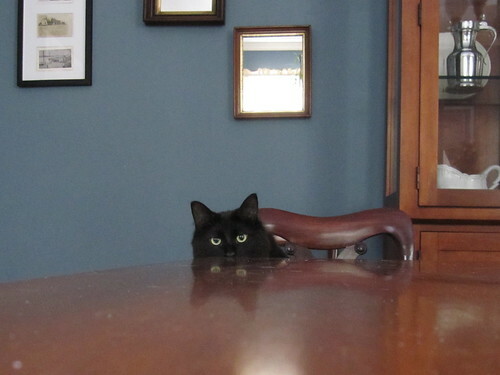 The cat in the picture could be my Nicky peeking over the table top. You wouldn’t happen to know the shade and brand of paint on the walls in the picture would you. I like it.